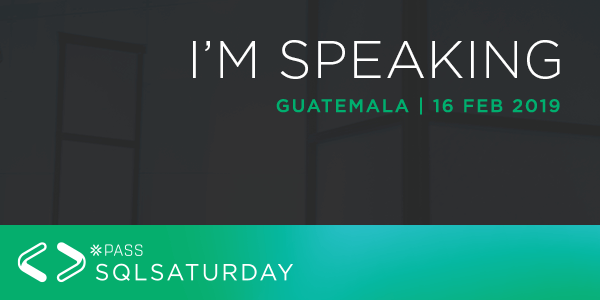 I’m very happy to announce that for the second year in a row I will be participating as speaker in this year’s SQL Saturday event in Guatemala city! This is an intro session, where I explore the options that Microsoft Azure offers when deploying SQL Server solutions in the cloud. This session is about with SQL Server running on Docker containers or Kubernetes. This is topic that I personally enjoy very much to talk about, because is what database experts call “The Future of Database Infrastructure”. This year is a little bit different for me, because the Guatemala SQL Server User group (that I happen to be the leader) will have more participation. Also will like to take advantage of this post thank our user group sponsors MSSQL Tips and Sentry One that offered us help with some swag for the event and also our monthly meeting events. As any SQL Saturday event organized by PASS, you can register and attend for FREE, this is a really good opportunity to get training for free, networking and also to have fun! Don’t miss this opportunity, it takes less than five minutes to register. You can do it here. This entry was posted in Career, Conferences, PASS and tagged Career, Conferences, Guatemala, LATAM, PASS, Speaking, SQL Saturday, SQL Server on 02/14/2019 by DBA Master.